Originally from Colombia; Ms Triana has a Bachelor’s degree in music Education from Industrial University of Santander. That same year, she started Viola under her former Violin professor Andrzej Lechoswki (Poland) and has pursued her career in viola since then. In fall 2015, Ms. Triana started her graduate studies at UTA under Renowned professor, Violist Catherine Forbes. Ms Triana has attended various summer music academies, between them are Conservatory Music in the mountains, in Durango, CO 2013, Wintergreen music academy, Virginia 2014 and most recently, the Miami Summer Music Festival, Miami 2015. Her professors have been Andrzej Lechowski, Dr Misha Galanov and Professor Catherine Forbes, and she has taken Master Classes with Honggang Li (shanghai string quartet), Meredith Snow (L.A symphony), Steven Larson (Tertis Viola competition silver prize from 1997), Michael Klotz ( Amernet string quartet) and Milena Pajaro Van De Stadt (Dover string quartet). 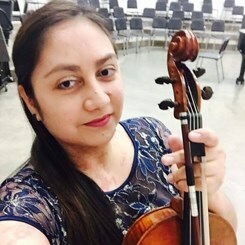 Currently, Ms. Triana teaches Violin and Viola at Music and Arts and is Principal Violist of the UTA Symphony Orchestra. Request Lessons with Genny today!